Last night I used a Celestron 130mm f/5 Newtonian on an AZ, GOTO mount and discovered that there was not sufficient back focus (in focus) to bring the stars to focus at prime focus. I placed the lens assembly from a x2 Barlow on the end of the nosepiece to which a light-pollution filter was fitted. This solved the problem but, of course, increased the image scale. Using time delay for releasing the shutter I took a number of 30s exposures at an ISO value of 12,800. This high value is only allowed for exposures up to 30s. For bulb exposures (which are required for exposures greater than 30s), the maximum ISO value is 1600. These initial results are promising and it is clear that the camera is able to see the red of Hydrogen alpha in the nebula. An Atik 314L camera was placed at the prime focus of an autoguided f/5, 80mm refractor. Six 15-minute sub-exposures were taken through each of the narrowband Sll, H-alpha and Olll filters. The raw data were dark-frame, Flat-field and bias calibrated and stacked in Deep-Sky-Stacker. Post-processing was done in Photoshop with the following mappings to produce a false colour image known as the Hubble Palette. Ionised sulphur (Sll) was mapped to the red channel, Hydrogen-alpha was mapped to the Green channel and doubly ionised oxygen (Olll) was mapped to the blue channel. Last night a Samsung compact camera was placed at the 20mm Plosl eyepiece mounted in a rig to hold it in place. Time delay was used to make the exposures so that vibration could dampen down before the shutter released. Two images were captured, one at an ISO value of 80 and another at an ISO value of 1600. 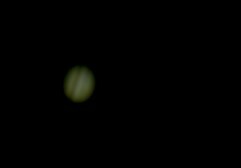 This demonstrates that afocal imaging is not restricted to lunar photography and that with a little patience and luck, planetary imaging is also possible. 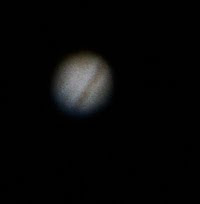 Then a x2 Barlow was placed on a Canon DSLR camera and this was attached to the SCT. In both images it can be seen that the SEB has started to re-appear. A Modified SDC-435 camera was placed at the prime focus of an autoguided 5", f/10 Maksutov. The trapezium stars are exciting the gas in the surrounding nebula.